If you’ve sworn off debt but are trying to dig your way out, 0% balance transfer credit cards can be a great tool. You have to know that you’ve completely sworn off incurring any more debt in order to play the 0% balance transfer game, but if you’re certain then you can save a ton of money by taking advantage of some of the best balance transfer credit card offers. Most balance transfer credit cards will offer you a promotional 0% balance transfer period lasting up to 18 months. Simply transfer your debt balance to the credit card and they won’t charge you a dime in interest until the promotion period ends. There may be balance transfer fees such as a set dollar amount or a certain percent up to a cap, but the best 0% balance transfer credit cards will waive this fee! However, the game is a very dangerous one. You MUST be extremely careful and pay off the full balance you transferred before the promotional period ends. If you don’t, then you could be charged interest all the way back to the day you initially transferred the debt! That can add up fast as interest rates on credit cards are normally pretty high. This will likely lead to you losing more money than you saved so you have to have a very solid game plan. So now that we have the basics out of the way, let’s take a look at the best 0% balance transfer credit cards currently on the market! If your sole purpose in getting a new credit card is for balance transfer features, the Slate credit card by Chase is the hands down winner. Why? While most 0% balance transfer credit cards charge a flat fee or percentage to transfer your balance, the Slate card from Chase has no balance transfer fees at all if you transfer your balance in the first 60 days! This feature can easily save you 3% or more since most other 0% balance transfer credit cards charge a 3% fee at a minimum. 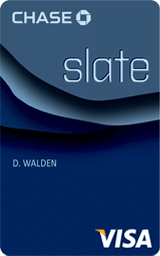 The other amazing feature of Slate is that the introductory period 0% period lasts 15 months. There are some cards, (a couple listed below) that offer longer time periods, but you’ll definitely be paying balance transfer fees. Run the numbers to see if the 15 month 0% no transfer fee option is better for you. The Slate card from Chase has no annual fee and has a special feature called Blueprint that will help you to avoid paying interest by paying down your balance based on guidelines you set. As with any card, please read all of the fine print and details on the application before you sign up. You need to completely understand the details to ensure you don’t pay any extra fees or interest! The Discover It credit card is another strong contender for the best 0% balance transfer credit card. When you’re signing up, make sure to pick the 18 month 0% balance transfer option to get the longest 0% introductory period possible. This card has one of the longest 0% balance transfer introductory periods at 18 months. I haven’t seen another card with a longer time period on the market lately. In addition to that, the Discover It credit card will give you 5% cash back on rotating quarterly categories and 1% cash back on all other purchases. This card won’t nickel and dime you either! It offers no annual fee, no overlimit fee, no foreign transaction fee and no pay by phone fees. They’ll even waive the late fee on your first late payment… but if you’re making late payments you shouldn’t be using 0% balance transfer credit cards. On top of that, they won’t increase your APR for paying late… although, as always, there are exceptions. The other nice features include a Cash Back Concierge and 100% US Based HUMAN customer service. Not many cards offer that these days unless you pay an annual fee. A new bonus that Discover has added on this credit card is that you’ll have your FICO® Credit Score on every monthly statement to help you stay on top of your credit! Be aware that balance transfers have a 3% fee on the Discover It credit card. The Citi Simplicity credit card is exactly like it sounds, extremely simple. The Citi Simplicity card has an 18 month 0% balance transfer AND purchase introductory interest rate. Whenever you transfer your balance you’ll pay a fee equal to the greater of $5 or 3%. Other than that, this card has no late fees, penalty interest rates and no annual fee… EVER. How awesome is that? They also promise fast, personal help, 24 hours a day! The Citi Diamond Preferred credit card offers an awesome 18 month 0% introductory rate on balance transfers. They do charge a $5 or 3% fee, whichever is greater, on all balance transfers. As a Citi Diamond Preferred card holder, you’ll have access to use Citi Price Rewind, which allows you the potential to get a lower price after you purchase an item. You’ll also have access to a 24/7 concierge to help you book hotel rooms or flights. You also get access to Citi Private Pass for special access to presale tickets and other awesome experiences. This card does NOT have an annual fee either! Lots of benefits and no annual fee is always a great combination. The Chase Freedom is one of my favorite all around credit cards and it even comes with a 0% intro APR for 15 months on both balance transfers and purchases! The Chase Freedom Visa credit card does have the typical $5 or 3% (whichever is greater) balance transfer fee, but with all of the extra benefits, it might be worth paying the fee. If you spend $500 within the first three months you’ll receive $100 cash back. Just to be clear, balance transfers do not count toward this spending limit. You’ll also get 5% cash back in rotating quarterly categories and 1% cash back on all other purchases. You’ll never pay an annual fee on the Chase Freedom credit card and your rewards won’t ever expire. I absolutely love this credit card and it is easy to see why. If you don’t have any balances to transfer, there are other credit card options and you can read more about them in my post, the best sign up bonus credit cards of 2014. Alternatively, if you buy a ton of gas, you may want to look into the best gas credit cards. The credit card game can be beaten, but in order to get the rewards there are risks. I ALWAYS pay my credit card off in full every month and you should too. If you can’t do this I would suggest against getting credit cards. You absolutely should not get new credit cards if you know you have an ongoing problem with debt. You should not tempt fate unless you’re certain you have changed your charging ways forever. The benefits do NOT outweigh the risks. What 0% balance transfer credit cards have you used and how did it work out for you? What other balance transfer credit cards are you considering? I’d love to hear your input below in the comments! The information stated above is, to the best of my knowledge, correct as of February 4, 2014. The offers on this page will change periodically as offers change. As with any offer, make sure to read all of the details on the application site as those are the terms and conditions that will govern any credit card you sign up for. What you have read here is simply a summary and does not contain all terms and conditions. « Did You Buy Any Of These 4 Things People Buy But Never Use? I like that you started by saying people need to be responsible before using these. The prospect of cheap credit is very dangerous indeed. That said, I have used 0% balance transfers in the past. They’re useful. Zero interest card can be a great way of reducing debt, however it can also be a trap. The credit card company is betting against you thinking you will go past the zero interest deadline. They still get a fee to transfer the balance so it is not entirely free. If you have the discipline, it is a greta way of using the system. Nice list! My favorite card is the Discover as I just have a wonderful experience with them and heck 18 months 0 interest sounds good to me. I try not to use the cards but if you already have a balance you should a least find something with the lowest interest.